The white-glove buildings of Manhattan have formally arrived in Park Slope. Naftali Group has revealed prices for the Landmark Park Slope, a rental building at 267 Sixth Street, in the neighborhood of the same name, DNAinfo reported. The Karl Fischer-designed tower, between Fourth and Fifth avenues, comes complete with “hotel style amenities,” including a concierge tasked with making dinner reservations and procuring in-demand concert tickets. The 104-unit property — slated to open in August — will ask $2,100 for a studio, $2,800 for a one-bedroom and $3,700 for a two-bedroom. The 12-story tower launched a teaser web site in March. The ground floor will offer 3,556 feet of retail space in two units on the corner of Sixth Street and Fourth Avenue. 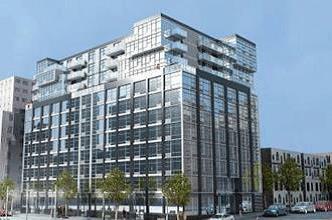 Naftali Group told DNAinfo the spaces will rent for $60 to $65 per square foot. They said they have received inquiries, but have not signed tenants. The building will feature a full-time doorman and a roof deck with a cabana.